Found 3 file extension associations related to VSampler and 3 file formats developed specifically for use with VSampler. 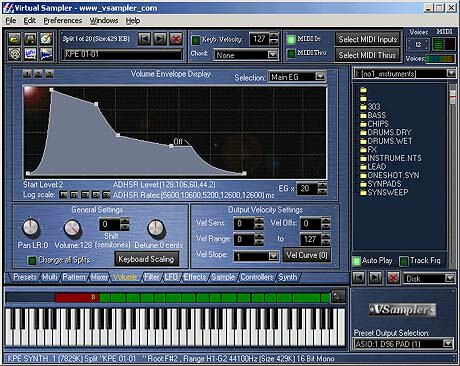 Speedsoft VSampler is a program which turns your PC into a polyphonic sampler. You will be able to use any recorded sound as a musical instrument, through this 255 voices sampler. VSampler can save files in SF2 format, and can also load instruments saved in that format, Gigastudio, HALion 1 + 2, Kontakt 1.x, DLS, AKAI, E-MU III / IV CD, plus LM4 Battery drumkits, ReCycle (RCY, REX, RX2) and ACID drumloops. You can also load files in .WAV or .AIF formats, and save them in .WAV format. If you need more information please contact the developers of VSampler (MAZ Sound Tools GmbH), or check out their product website.